What if your operating suite could function like a synchronized symphony, where everyone knows what to and when to do it? With TAGNOS' Orchestrated Workflows, your team no longer has to wait and react to daily scheduled and unforeseen events in your OR. We provide the insights you need to shift from reactive response to predictive operations, so you can maximize daily scheduling and create a world class operating room experience for staff, patients, and their families. TAGNOS brings together all the functions required for successful room turnover and optimized patient flow under one communication umbrella - surgeons, anesthesia, charge nurses, environmental services / housekeeping, and BioMed teams can all obtain a view into patients' movement and proactively prepare their workflow steps accordingly. This eliminates the guesswork, phone calls and footsteps often required from manual approaches. Add an additional layer of intelligence to your workflows with TAGNOS’ AI application of Machine Learning to predict case lengths and increase surgery capacity. We utilize a powerful combination of historical data, including surgeon and procedure type, with what’s happening in real-time to adjust how long a case will take – with up to 96% accuracy. With TAGNOS, you’ll create more accurate schedule blocks and give care teams and ancillary staff information as to when cases will actually start and end so they can coordinate their workflows, reduce the need for overtime and cancellations, and truly Operate as One. Optimize your room turnover process with TAGNOS’ mobile app that can be used on any handheld mobile device. 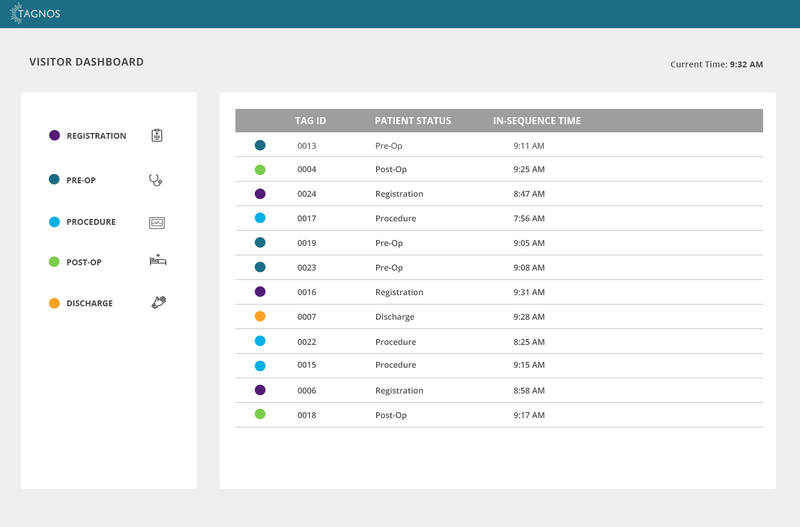 Set up and receive alerts at specific points of the patient flow sequence to help orchestrate your care teams’ workflow movements. This insight provides the data everyone on the care delivery team needs to initiate faster room turnovers and alert the clinical team so they can start and finish on time – all without manual data entry and unnecessary communication steps. Families can view where their loved one is throughout the surgery process with TAGNOS' visitor dashboard located in hospital waiting areas. Peace of mind is provided to family members as they see the transition of their patient's progress, and Less burden is placed on staff members to put anxious family members at ease. Use Amazon Alexa to document key surgical milestones via virtual assistant. Enable automated voice interaction to document critical timestamps and save your team's handiwork for patient care, not point-and-click interfaces or pen and paper.